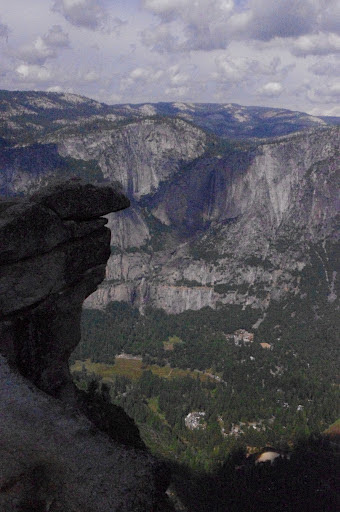 If you misssed Part 1 of my adventures to Yosemite in 2011, catch up here. It figures once you have explored the valley floor over, then the only angle left to explore is the views from above. And so we did – although not by any dare-devil means like rock climbing, abseiling or jumping off anything, even though that seemed pretty much what everyone else has come to do (I decided I really wanted to do the rest of my trip and arrive home in one piece, not a body bag!!). Somebody did die rock-climbing the week before we visited. And someone else had to be rescued by a helicopter…. 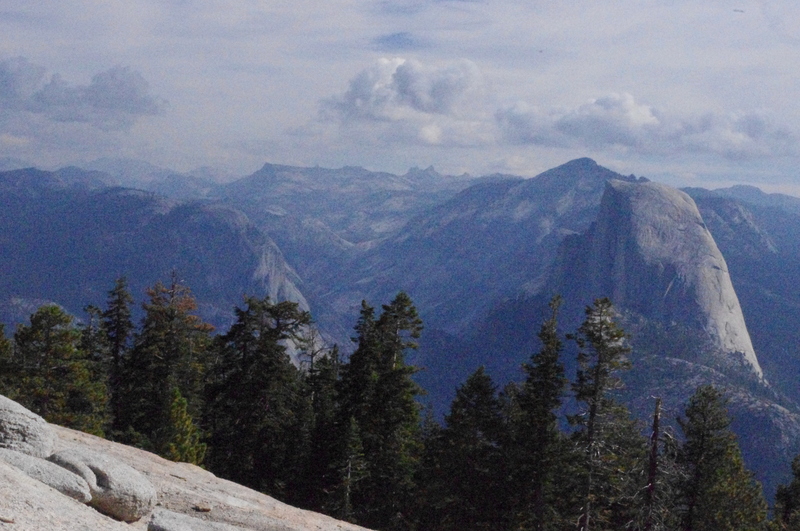 climbing up along Sentinal Dome: view out over Half Dome. But back to walking to the top of the park….the breath-taking views I saw really can’t be compared to anything else I have seen in my life – you’re up higher than anywhere in Australia, looking down over something that has taken millions of years to form and is thankfully protected again human destruction (mostly). You can (if brave and foolish enough) walk from the valley floor all the way up to the top. That’s nearly 5 miles up, and right on 1000m elevation gain. My maths skills put to the test, that’s a pretty steep gradient. Thankfully there’s another, easier option – to drive! 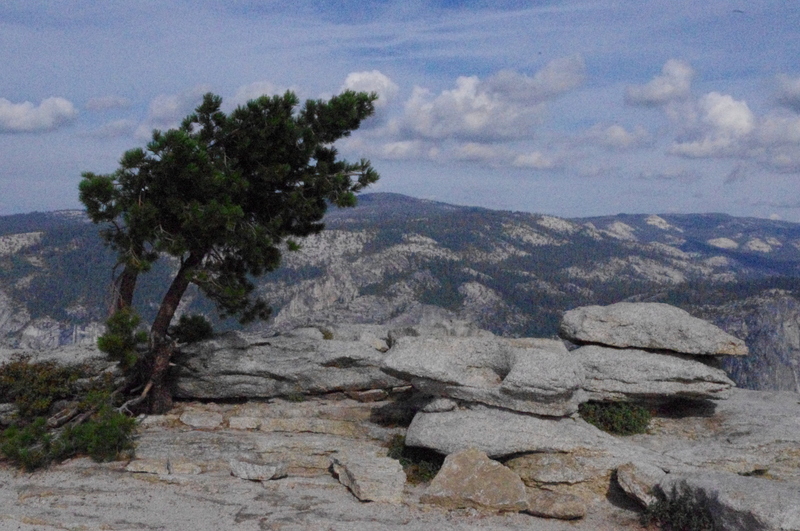 In the car on the way up, the landscape swiftly changes from lush and evergreen conifers to sparse and windswept. The engine worked hard, we wound on past boulders, wildflowers, and picnic spots. The actual walk up from the road to the top of Sentinel Dome (8122ft high) is really short comparatively….a steep rock-hopping puddle jumping affair. But with the elevation came two things: wind chill and views. Standing at the top – as I said, higher than Australia – the colours are different. The contrast a little sharper, yet distances deceptive. From here, after another rock scramble down without any mishaps we landed at the edge. Quite literally.